Fleming's left-hand rule (for motors), and Fleming's right-hand rule (for generators) are a pair of visual mnemonics. They were originated by John Ambrose Fleming, in the late 19th century, as a simple way of working out the direction of motion in an electric motor, or the direction of electric current in an electric generator. When current flows in a wire, and an external magnetic field is applied across that flow, the wire experiences a force perpendicular both to that field and to the direction of the current flow. A left hand can be held, as shown in the illustration, so as to represent three mutually orthogonal axes on the thumb, first finger and middle finger. 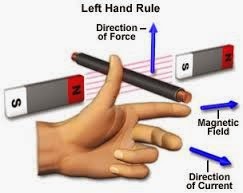 Each finger is then assigned to a quantity (mechanical force, magnetic field and electric current). The right and left hand are used for generators and motors respectively. To work out the direction of force experienced we use Fleming's Left Hand Rule. Your first finger points in the direction of the magnetic field (North to South). Your second finger points in the direction of conventional current (positive to negative). Your thumb points in the direction of the thrust or force on the conductor.